By definition, a service area is “who an organization serves.” Not who they want to serve, but the geography they actually, currently serve. This means the organization has to consider market share from the geography, it cannot be based solely on patient origin. Let’s get started by considering the various ways a hospital can define their service area. 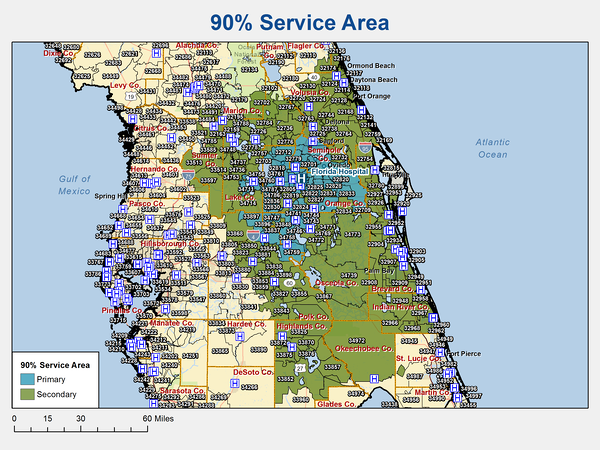 This service area approach simply lists patient origin by ZIP codes until a specified percentage (75%-85% typically) of total patient origin is reached: 50-60% for primary service area (PSA) and 25% or so for the secondary service area (SSA). When using this method, the service area may end up looking like the one below—including non-contiguous ZIP codes and with holes in the area (ZIP codes surrounded by the service area but not included). With the regional strategy, the facility defines a service area as large as possible. A facility may define its PSA as 75% of its inpatients (and/or outpatients) and its SSA as the next 15%, for a total of 90% patient origin. This is the “no ZIP code left behind” definition. This service area definition will most likely incorporate a very large geographic area and ZIP codes where the hospital has very low market share. The service area below demonstrates 90% patient origin. A service area defined by 90% of patient origin may result in a service area that expands into who you would like to serve, not who you actually serve. In order to officially ‘serve’ a ZIP code, the hospital needs to have some market share there. Two key areas where an overly large service area can cause issues are marketing and physician recruitment. Marketing departments with limited budget and staff struggle to make a meaningful impact over such a large geography. The large area also causes a lack of focus by your physician liaisons, potentially leading to missed opportunities with partner physicians close to your facility. However, if a facility is looking at a regional outreach strategy or growing a specialty service line, a larger service area may be appropriate. We have customers who utilize a “growth” or “expansion” service area, indicating areas they don’t currently serve or serve only slightly but would like to design strategies to expand into the geography. The 2004 Stark regulations relative to physician recruitment and payments define a hospital's geographic service area as the lowest number of contiguous ZIP codes from which the hospital draws 75% of its inpatients. Some hospitals prefer to define their service area in this manner, essentially killing two birds with one stone—the service area for marketing and planning matches the physician recruitment service area. However, what is ideal for physician recruiting may not be ideal for service line growth and development. If 50% of cardiology patients come from two ZIP codes, but 10 ZIP codes make up 75% of patients in contiguous ZIP codes, cardiology development loses geographic focus. In addition, there is a large hole in our service area southwest of the hospital. Our market share there is significant even if it isn’t included in the top 75% patient origin. We still may want to have a marketing or planning effort aimed at this geography. The Stark defined service area for a hospital is an easy solution, as you should already have these defined. But be careful when using tools out of convenience over selecting the right tool for the job. When using ZIP codes, we prefer a more focused PSA representing around 50% patient origin with an SSA for the next 25% of patients. If a growth service area is warranted, then the next 15% of patients is sufficient. Sounds simple, right? As football analyst Lee Corso says, “not so fast my friend.” The percentages are science—now, let’s move on to the art. The service area below demonstrates a more deliberate, thoughtful service area. The PSA represents 53% of patient origin while the SSA represents 27% patient origin. 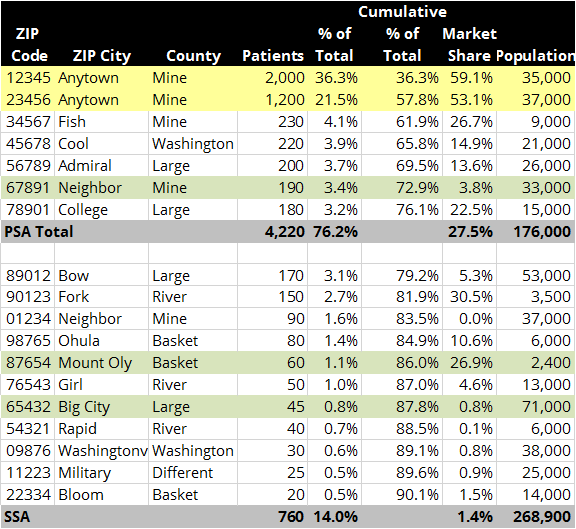 Not only did we look at patient origin, but we also examined the market share of each ZIP code. The market share of the PSA is 75% and the market share of the SSA is 27.7%. Marketers, planners, and physician relations staff have a much more meaningful geography in which to focus their efforts. Reducing your definition to 50% and 75% increases your ability to know your patient base and to focus on geographies you actually serve. When selecting ZIP codes for a PSA and SSA as defined above, gather four pieces of information: 1) patient origin by ZIP code, 2) market share of top 85% of patient origin ZIP codes (if available), 3) population by ZIP code, and 4) the physical location of the ZIP code on a map. Select ZIP codes for the PSA representing approximately 50% of patient origin (blue area above), where the facility has higher market share, and that make sense geographically. Select ZIP codes for the SSA that represent approximately the next 25% of patient origin, where the facility has decent market share, and that make sense geographically. What does “make sense geographically” mean? Essentially, it means eliminating ZIP codes on an “island” away from the rest of service area or adding “holes” back in to fill in gaps inside the newly defined service area. There were examples of holes and islands in the previous service area examples. ...But that is not the end of the story. When address-level patient data is available, a custom polygon shape file built from your geo-coded patient data can serve as the best solution for marketing, planning, and physician relations. Building a custom market service area based on your patient data tells the most accurate story of your service area. The service area above is based on an algorithm between the hospital location and the actual geocoded addresses of their current patients. ZIP codes were built to deliver mail. They have no real influence on where a patient decides to receive healthcare services (when they have a choice). The market service area shows where patients come from regardless of random geography boundaries—counties, ZIP codes, census tracts. Large populations are included in your service area by using standard geographic boundaries like ZIP codes. Overlaying the market service area approach with the ZIP code approach helps you visualize the difference. There is a large ZIP code included in this hospital’s service area, but they really only serve the northeastern portion of the ZIP, so that’s where the focus should be. Using a tighter service area is a great first step to improving your service area definitions. But many times this is not the end of your journey. Adding a quick study of market share and population by ZIP code keeps a facility from “majoring in the minors”, or focusing too many efforts on the wrong ZIP codes. As a fictitious example demonstrated in the chart below, Brentwood Medical Center facility gets a mere 3.8% market share of ZIP code 67891. The other ZIP codes in the primary service area warrant more attention because they already have better traction, but now there is opportunity to grow. 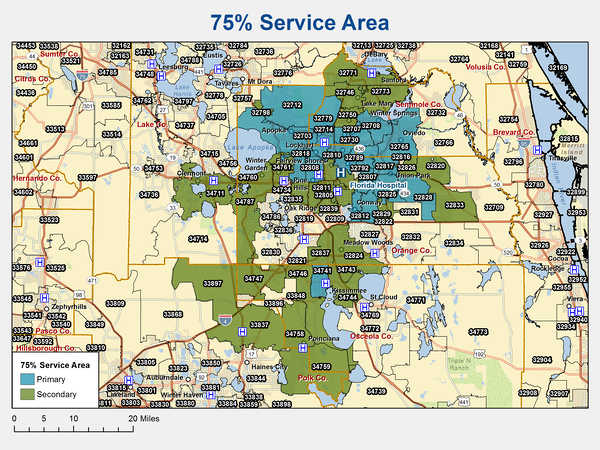 One could argue that if a facility only gets 4% of a market, then it’s NOT your service area. You may WANT it to be your service area, but it isn’t. In ZIP 87654, our facility gets 27% market share. However, there are only 2,400 people in the ZIP code. In this case, I’d recommend focusing on another ZIP code with more population first. In fact, I’d argue for focusing on two ZIP codes highlighted in yellow first, then the remaining list in the PSA, other than 67891. When you base the selection of your primary and secondary service areas on all four of these pieces of information, the end result is much more precise. Select ZIP codes for the PSA that represent approximately 50% of patient origin, where the facility has high market share, and that make sense geographically. Select ZIP codes for the SSA that represent approximately the next 25% of patient origin, where the facility has decent market share, and that make sense geographically. Below, we will cover a case study demonstrating the pros and cons of different service area definitions focusing on competitor identification. This case study is based on a real hospital and real service areas blinded to protect the innocent. Anytown is a city of 33,000 located in Mine County, population 159,000, 20 miles north of a metropolitan city with population of 752,000. Below is a table of market share by hospital listed by the different service area definitions discussed in-depth in this post. Eighteen ZIP codes represent 90% patient origin, 7 ZIP codes represent 75% patient origin (all contiguous ZIP codes with significant market share) and 2 ZIP codes represent 50% patient origin. The 7 ZIP code area is essentially the primary service area (PSA) and secondary service area (SSA) defined by PSA being 50% patient origin (the 2 ZIP code area referenced above) and the SSA the next 25% of patient origin combined. The table above demonstrates how the competitors change based on the definition of service area. Using two larger service area definitions, the primary competitor is Neighbor Hospital. However, when only looking at the two ZIP codes that make up 50% of patient origin, Large Medical Center becomes the primary competitor. If market share by service line is available, look at outmigration by service line to Large Medical Center. The only services out-migrating may be tertiary services Memorial Hospital doesn’t provide. In that case, our focus would shift to Nearby Town Medical Center as our primary competition if they are seeing patients in service lines where we offer the services. In the 7 ZIP service area, Neighbor Hospital is our primary competitor, followed by Nearby Town Hospital. 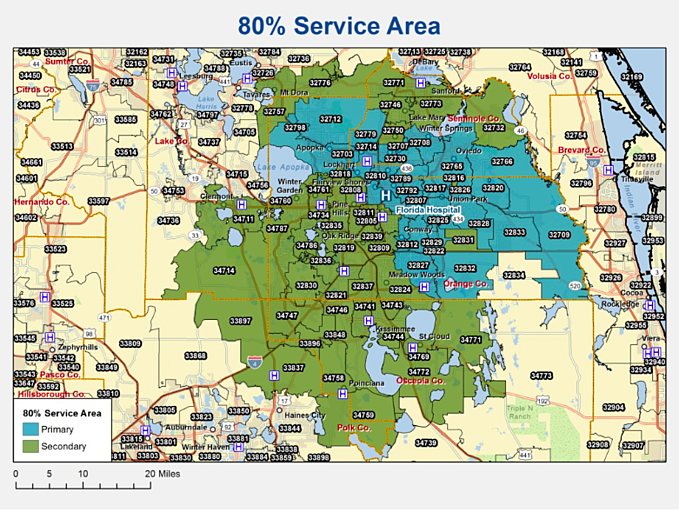 Also, notice the how the market share percentages change as the service area changes. Using the 18 ZIP code definition, our hospital has a market share of 13.1%. When using the 7 ZIP code service area our market share is 27.7%. Using the 2 ZIP code definition, our market share is 56.9%. I would argue that the primary service area of our hospital is the 2 ZIP code definition. Those are the people we primarily serve. This case study demonstrates the importance of a thoughtful, deliberate service area definition. 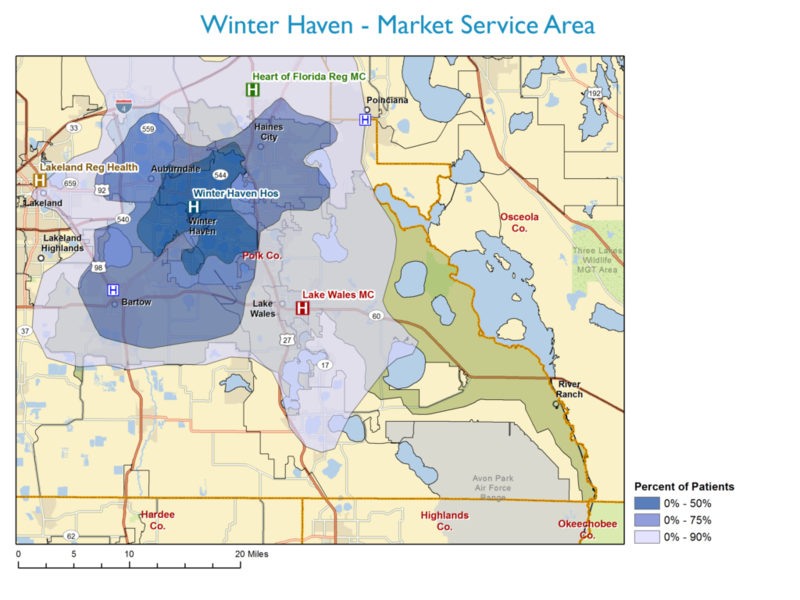 A well-defined service area assists with targeted marketing and physician business development. It also assists in understanding who your true competitors are by service line. The service area definition is both science and art involving the use of analytics and judgment. If you would like to learn more about Stratasan and how we can equip your team to define your service area in the most effective way possible, contact sales@stratasan.com.